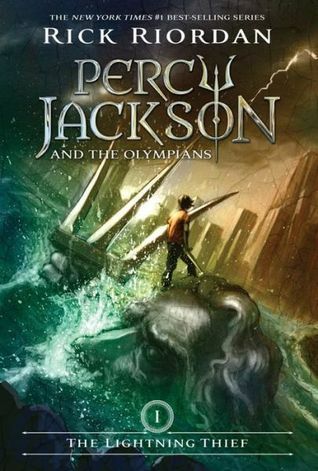 I finally started Percy Jackson and the Olympians (!!!!!) and I AM SO HAPPY. First thing to know: I shouldn't have waited so long to read The Lightning Thief. I REGRET IT SO MUCH that I am only just now getting into this series. It's just so engaging and fun and I love all the elements of mythology. Second thing: I've started this particular book on multiple occasions through the years but something always came up. Third, and final, thing: one of my biggest goals of 2019 is to read the books that I wanted to read growing up, but couldn't. Thus, The Lightning Thief wound up at the top of my TBR. IT. IS. SO. FANTASTIC. I love these characters and the plotline so far. Everything about it was just F-U-N. Pure and simple, fun. I can definitely see why it's so beloved in the book community. It's rightfully earned its praise and following. What I liked most about The Lightning Thief was the way that it utilizes the mythological aspects of its world. Riordan really adapted these myths in a way that engages his readers. While it is particularly aiming for younger readers, adults will find plenty to enjoy in the series. I was unable to put the book down once it really got into its groove and I can't wait to continue along with my binge. Mythology has always been fascinating to me, and I love the way that various writers are able to portray it in so many different ways. Riordan manages to combine the real world, all things ordinary, and mythology so wonderfully. He makes these familiar elements, and names, his own, and works them into a story that's fully his own. And the way he crafts each character? It's impossible to not love Percy, Annabeth and Grover. I lied when I said that what I liked most about this book was the mythology; it's totally the characters. I loved them as individuals and the dynamics that came with their friendship, the quest they embark on. I can't wait to get to know them more in the next installment! Other fun things to note: great representation in Percy Jackson, and the other kids he meets along the way at Camp Half-blood, having dyslexia. I can't list any other middle grade book series, or YA in general, that features a character with dyslexia being less of a weakness and more of a strength. Overall, I really, really enjoyed The Lightning Thief and am excited to continue onward with the Percy Jackson and the Olympians series.